Free 8 Bit is Enough for Trogday! Hey, Telltale is giving awat sbdg4ap 8 bit is enough! Re: Free 8 Bit is Enough for Trogday! I just cant pass it up. It's the only one I dont own. This year, they're selling the whole season for a much cheaper price. Though I'd be shocked to find that anyone on this forum does not own at least one copy of it by now. I've got it on WiiWare. Though if my carpy entry in Telltale's Trogday Art Contest by some miracle wins, I might consider getting getting SBCG4AP for PC for that sweet DVD. I have it on PC, but not the DVD. I bought all of the episodes one at a time, two or three months after the games came out. And I bought them in a weird order: 5-4-2-3-1. And 8-Bit is Enough didn't seem that good, and I wondered why everyone liked it so much. But then, when I replayed them, I realized why it's so great: it really excels as a FINALE. It wraps up all of the episodes greatly, and references them all in one way or another. I didn't get my Wii until over a year later, so, y'know. Kinda didn't care about WiiWare yet. Uzi-Bazooka wrote: I bought all of the episodes one at a time, two or three months after the games came out. And I bought them in a weird order: 5-4-2-3-1. Holy crap, that's the same order I bought 'em on WiiWare. 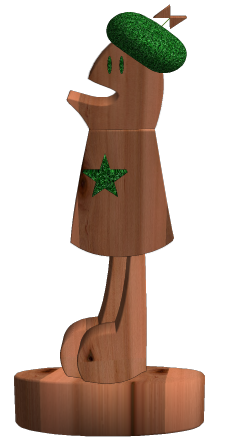 By the way, once voting starts on Telltale's Trogday Wood Anniversary Art Contest, would anyone here that's also on Telltale's forum mind lending a vote to my entry, Woodland Homestar? Sure! I don't have the carving or Photoshopping skills to enter anything myself, and I'm pretty content with my 5 double-clicks as it is. Uzi-Bazooka wrote: Sure! I don't have the carving or Photoshopping skills to enter anything myself, and I'm pretty content with my 5 double-clicks as it is. I'm up against some tough competition. There's the toothpick and clothespin Trogdor, wooden No Loafing, and the vaguely wood-related Teen Girl Squad-esque Trogday fantoon. 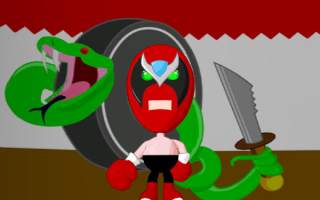 Clothespin Trogdor is lazy, Wooden No Loafing is actually pretty impressive despite being faker than Backsassin' Animatronic Strong Bad, and vaguely wooden TGS Fan Toon is actually kind of funny despite being something the Bros. Chaps would never ever ever ever ever do ever. I honestly wouldn't use "stiff competition" to describe any of them. Really? I think Clothespin Trogdor is pretty awesome in it's artsy-craftsiness. But hey, who am I to judge the opinion of someone that likes my fake wood sculpture best? Yeah. One more crack like that and I'm entering the contest MYSELF. If I had realized that there were only four entries, I WOULD have. I even thought about it. But then I thought, "Oh, no. Wheelie's my friend. I can't let him down." You are on thin ice, pal. Trust me, there are most definitely gonna be more entries. The deadline is Friday, and just about none of the artsy members of that forum have entered yet. Thankfully Irishmile, AKA the photoshop master of Telltale is sitting out of this one. And remember, a vote for Woodland Homestar is a vote for me getting the SBCG4AP DVD or BttF: The Game. I haven't decided which I'll choose if I win. I am really not interested in Back to the Future: The Game for reasons too numerous to write here. Go for SBCG4AP. Reason I'm considering BttF is because I'd sorta rather have a new game by Telltale than a DVD to one I've already played. Also, someone entered a Trogdor Minecraft statue. Crap! With the amount of popularity that game's been getting, you're screwed. Again, though: there's FIVE entries, and three people will win something. As for new games, you could always get Bone. Except, wait, that's stupid. So I guess I can see your reasoning. Actually, four people get something. First prize winner gets three seasons of their choice and the three runners up get one season of their choice. Aside from Bone, my choices are Wallace and Gromit and BttF. And since I already got Muzzled! free (brilliant episode, by the way), I'd rather take 5 free episodes than 3. Oh, yeah. Forgot about Wallace and Gromit. I forgot about that. The number of episodes does not matter. What matters is the quality of the game. I mean, if more is better, S&M1 should be at the top of everyone's Telltale list, instead of at the bottom. Yeah, but from what I've heard, the other three episodes of W&G are about the same quality as BttF so far. Plus the concept of a BttF game appeals to me more than a W&G game. So yeah, it'd be the one with the Delorean for me. This right here, this is the one place where we differ. But hey, if you win, you can get both of those AND SBCG4AP. I'll still vote for you, Wheelj, but will anyone else?